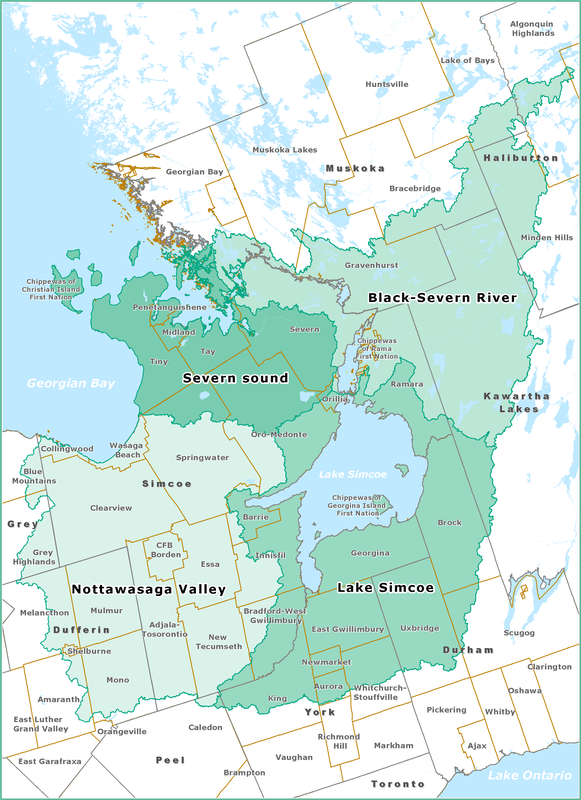 The South Georgian Bay-Lake Simcoe Source Protection Region contains four watersheds and spans over 10,000 square kilometres, from the Oak Ridges Moraine in the south to the Canadian Shield in the north. The region contains portions of the Niagara Escarpment, Oak Ridges Moraine, Oro Moraine, Peterborough Drumlin Fields, Simcoe Uplands and Lowlands and the Canadian Shield. The region also contains 52 municipalities and three First Nations communities with over 275 municipal supply wells, 16 municipal surface water intakes, and more than 50,000 private wells. The South Georgian Bay-Lake Simcoe Source Protection Region is very complex and diverse in terms of geology, physiology, population, and development pressures, with a variety of existing water uses including drinking water supply, recreation, irrigation, agriculture, commercial and industrial uses, as well as ecosystem needs.